So far, 39 people have	completed this assignment. Too bad Facebook was not around for most of history! Use the Fakebook tool to make a Facebook profile for a historical figure and make a fake tweet for the same character using the Twister tool. 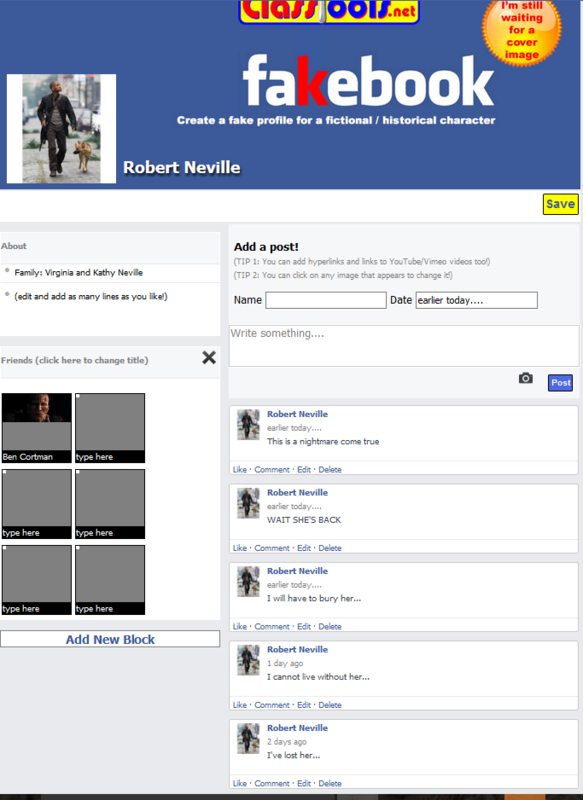 See for Abaraham Lincoln the example of a fake facebook profile and what he might have tweeted. Make sure what you create is coherent with the person's background, and explain what it might have meant for that person to use Facebook and twitter "way back then". Include screen shots and links to what you created, and elaborate on what their use of social media might have been like if it existed for them. This is a Fakebook for Steve Irwin. I chose him because although he ins’t as old as others I remember idolizing him as a child. Social media wasn’t really in full swing back then. I tried to keep it funny and lighthearted because that’s what I really remember. 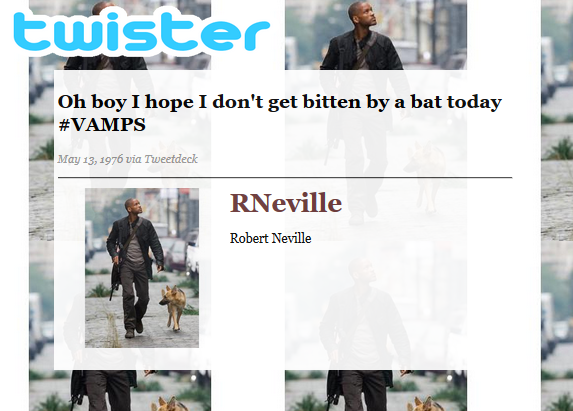 The context to this tweet was how Robert Neville became immune to the vampire like virus. He was bitten by an infected bat and some how he had built an immunity to the virus that spread on the Earth. My first assignment was worth 3.5 stars, but I am going to claim that I did 4 stars worth of work. I put quite a bit of time in this one! If Twitter existed during our era, I dream you would tweet me just what I wanted to hear . It would be worth so much more than a mere three stars … In fact, it would be worth more stars than there are in the sky. Social Media during the Russian Revolution?! I’ve mentioned in a previous post that I particularly love Russian history. My interest started when I was a wee little thing and first saw the movie from Fox Animation called Anastasia. For this assignment I made a fake Facebook and Tweet for George Washington. I thought it was kind of funny because I go to Mary Washington. I attempted the What They Might Have Done in Social Media (3 stars) Web Assignment. 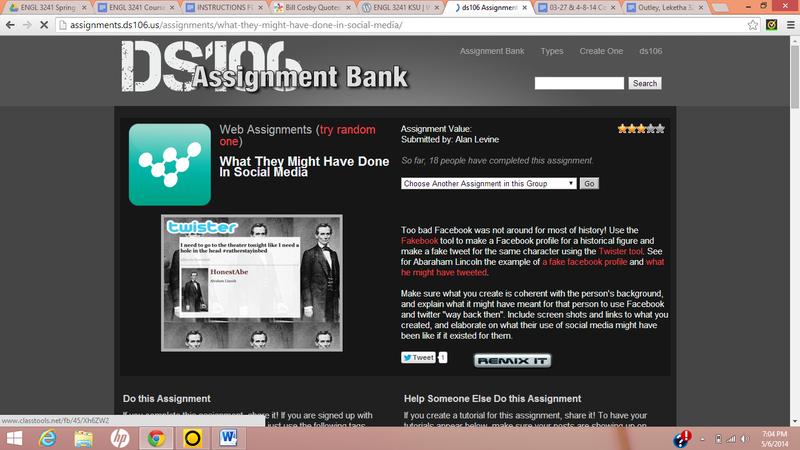 The assignment was to make fake social network accounts for a historical figure. Facebook and Twitter for… JFK! For this assignment, I chose the historical figure of our 35th President of the United States, John F. Kennedy. Turns out, JFK seemed pretty hip to the social media scene back in the 1960’s. The game’s done gone and changed y’all…or has it? Well hello again! I hope everyone’s week three ended well. This was a whirlwind week for me, with tons of assignments in all of my classes. But I’m not here to talk about that. I’m here to talk about The Wire and digital storytelling, so let’s get into it. I had posted this in my weekly posts, but I wanted this to be filed separately in the assignments category, you know, so it’s easier to find and all. Here is the last component of my final project! For this final assignment, I wanted to do a web assignment, so I went with one of my favourite ones, the “What They Might Have Done in Social Media” assignment. While browsing through the web assignments list, this one definitely grabbed my attention. It’s probably because one, I’m taking a course called “Social Media” this semester, and two, I have a social media internship right now. So yeah, I definitely felt obligated to do this. Henry VIII’s got SWAG – ??? My blog title/song title will make sense once you are done reading this blog post, trust me! The purpose of this assignment was to use the Fakebook tool to make a Facebook profile for a historical figure and make a fake tweet for the same character using the Twister tool. Who has watched The Tudors before? well I have just started it and so for the Fakebook assignment I decided to do it on Henry VIII, send him a fakebook friend request today! What if Twitter and Facebook were around back in the day of exploration? In the assignment description, there is a link to the right side titled Twister Tool. Click on it!